And let’s face it—even if we choose only the best organic foods and do our utmost to eat a balanced, varied diet it is extremely difficult to ensure we have gotten every last needed nutrient. The reason for this could be the subject of another entire blog. So let me just say that the foods being raised and harvested today are often lacking in the full nutritional value we think they should have. I can think of three main remedies for supplementing nutrition. The first, of course, is vitamins. The subject of vitamins is very broad itself and there are many, many experts on this subject. I am not an expert. I have a basic understanding though. Since my focus has always been on eating whole foods, and since vitamin supplements are not whole foods, I don’t consider vitamins as a major form of good nutritional supplementation. I take vitamins on a medicinal basis. In other words, there are times when a boost from taking a particular vitamin supplement is just the right solution. These are times when getting that boost from whole foods is simply not enough. Another remedy for supplementing nutrition is by eating certain foods or food products as a supplement. Wheat germ has certain vitamins and minerals including iron. Blueberries and acai berries are high in antioxidants. Goji protects the liver. Cacao for better brain function. The list goes on and various so-called super foods “hit the charts” and make it to the top ten. From year to year we get deluged with the news that this food or that food is the latest and the greatest. Right now coconut water and chia seeds are going strong! The best of these miracle foods are eaten as whole food. Extracts, juices and the rest are simply not as balanced. But the best of both worlds—whole super food plus outstanding overall balanced nutritional content—can be found in a pristine lake way up in Oregon where the most incredible wild-growing whole food has been available for eons. This food is called aphanizomenon flos aquae. 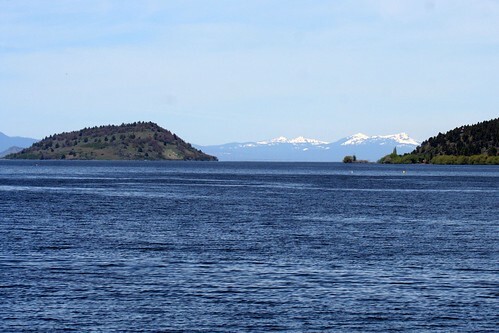 It is blue-green algae that can be harvested from Klamath Lake, the biggest freshwater lake west of the Rockies and one that is part of a unique environment up in the Cascade Mountains. I have been eating wild-harvested blue-green algae for over twenty-five years. This amazing natural food has amino acids in just the right proportion to create protein. It has more trace minerals and phytonutrients than you can name and certainly more than you can get in any other single food. It is loaded with chlorophyll and has a greater nutritional content than spirulina or chlorella. I have been to Klamath Lake during the harvesting season and have witnessed the care and attention given to gently reaping the fresh algae and handling it in such a way as to not lose its powerful nutritional quality. While there are a few companies who harvest algae from Klamath Lake, Oregon, I can tell you that the company I buy from–New Earth Life Sciences–has what I consider the best track record for successfully harvesting the food while ethically maintaining and protecting the incredible environment of Klamath Lake and the entire Klamath basin. I have personally experienced both short and long-term benefits from eating this algae and I have heard, over the last twenty or so years, so many wins and successes from other people who eat it. As a distributor for this product, I am in awe of its ability to provide people with so many of the missing ingredients that we need to remain vital and healthy. I know literally dozens of people whom I introduced the algae to fifteen, twenty or more years ago who are still eating it every single day to this day. If you would like to hear more about this product, I will be happy to give you the website, talk to you, or, if you are in my area, meet with you. All you have to do is contact me at mycookinglifebypatty@yahoo.com or go directly to my website. Thank you! I love the products because they are wild and are actually whole food. Please contact me at mycookinglife@yahoo.com if you want to talk about this. There are a few companies that harvest from Klamath Lake, so possibly your co-op will have it. I am biased toward Simplexity because I have seen in person how they handle the algae so the nutritional content is protected and I believe they are the best overall. And yes, I am a distributor for that brand. Cool site. I am interested in finding out more info about this stuff. Can you send me the web site? I have been using Melaleuca vitamins since 1996, and I do love them. I am healthy and strong. I have some hip problems, though and wonder if food and nutrition can help. I am also overweight and my hair is quite thin. I am looking at what I eat and if just changing that could help with these things. Yes, so could you send me the data about Simplexity? Sure Diane! Not positive I have a current email address for you. I just sent you a message on FB. Really? I am wondering if they have this at the co-op here. Will take a look. I do include seaweed in our diet for the health benefits. Thanks, Patty!